It’s time to go grocery shopping! You can get tremendous discounts and a buy one, get one free special on a variety of items when you use this MULTI-COUPON DISCOUNT SPECIAL AT KNIGHTS SUPER FOODS. You can find a multitude of discounts. Plain Cheerios, Cinnamon Toast Crunch, Cookie Crisp Cereal, Reese’s Peanut Butter Puffs, Trix Cereal and Bisquick Shake and Pour. And guess what? Those are just the BOGO specials. 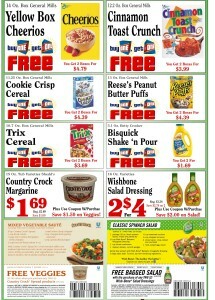 There’s also a sale on Country Crock Margarine and Wishbone Salad Dressing. Along with these great offerings comes recipes and other things. You know that if you go to the store with a list you will still find numerous things that you forgot that you needed. Or you can add to these staples and create a list that will give you an entire week’s worth or two week’s worth of groceries. You can’t beat having enough food to eat. Take the time to look at the circular so you will have a fair assessment of what you need, what’s on sale and what would be best for you to have. Knights Super Foods is taking the opportunity to give back to all its consumers in a very big way. Take advantage of these savings and pass them along to some of your family and friends. If you have a friend that has a large family, then all these cereal coupons will come in handy so that you will have a stocked pantry. It’s a very good deal.You can show your appreciation to the grocery store by going and sharing the wealth in the store. Knights Super Foods thanks you in advance.